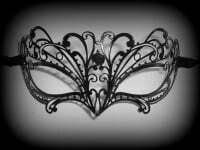 This elegant Venetian masquerade mask is made from laser cut metal and painted in silver/azure blue paint & glitter effect detail...Stunning masquerade mask for women. 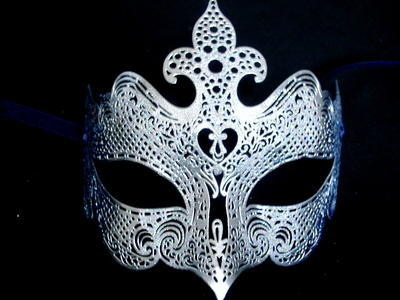 This beautiful Venetian filigree mask is made from laser cut metal and painted in silver/azure blue paint & glitter effect detail...Stunning masquerade mask for women who want to stand out from the rest at the ball. 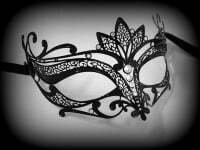 The mask has been handmade in the genuine Venetian tradition using a antique papier-mache former and the highest quality materials by the best mask makers in Venice, Italy....Certified authenticity.